Newfoundland became a western terminus for a commercial transatlantic air service in the 1930s. Airports opened at Botwood and Gander, and by 1938 regular weekly flights linked North America and Europe. But it was the Second World War that triggered the greatest advances in aviation. The Canadian and American armed forces expanded the island's existing airports, and built new ones at Torbay, Argentia, Stephenville, and Goose Bay. The colony became a vital refueling stop for Allied aircraft transporting personnel and supplies to and from Europe, and an important link in the ferrying of military aircraft to Britain. 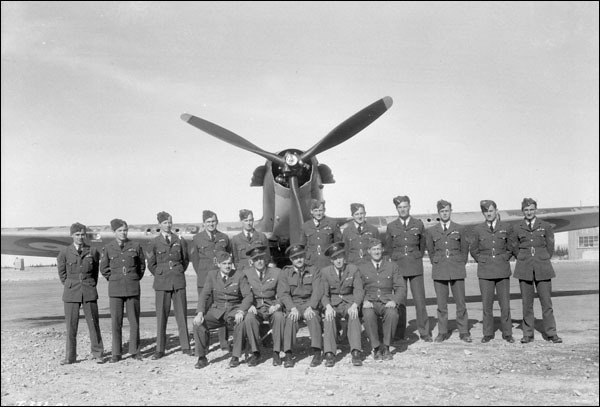 Most airfields were later converted to civilian uses, although 5 Wing Goose Bay has remained under the control of the Royal Canadian Air Force (RCAF). Photographer unknown. Courtesy of Library and Archives Canada (PA-133271), Ottawa, Ontario. Commercial aviation expanded after Confederation. Trans-Canada Airlines (today Air Canada) provided regular national and international flights, while local commercial airlines provided regional services within the province. 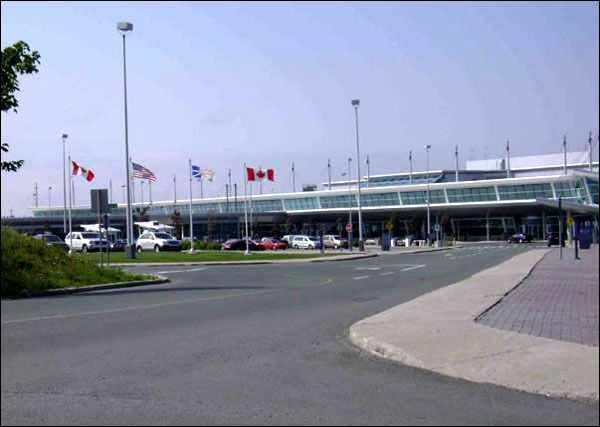 As of 2012, international airports exist at St. John's, Stephenville, and Gander, and smaller facilities are scattered throughout the province. A variety of airlines provide regional, domestic, and international flights. At the Imperial Economic Conference held at Ottawa in 1932, Newfoundland, Canada, the United Kingdom, and the Irish Free State agreed to establish a committee to investigate a commercial transatlantic air service. In 1935, government officials decided to build airports at Botwood and near Gander Lake to serve as western terminuses for sea and landplanes, respectively. Both sites were situated along the shortest air route between London and New York, known as the great circle route. Botwood also boasted a sheltered deep-water harbour, which was largely ice-free from June to November. The Gander Lake site was close to the trans-island railway and on a high, dry, and unobstructed plateau. An experimental air service was launched in 1937 as a joint venture between the British Imperial Airways and Pan American Airways. From 3-6 July, a Pan Am Clipper III completed the first west-to-east voyage between New York and Foynes, Ireland, with a two-night stopover at Botwood. A British Imperial Caledonia aircraft completed the reverse voyage from 5-9 July. The service soon expanded to include weekly transatlantic flights, and the Gander Lake facility, known as the Newfoundland Airport until 1941, opened in 1938. The outbreak of war in 1939 interrupted the development of commercial services, but also triggered rapid changes in the colony's airport facilities. Newfoundland's geographic location made it of tremendous strategic importance to both the Allied war effort and North America's defence, but the Commission of Government could not afford to develop adequate military facilities. As a result, the Canadian and United States governments agreed in 1939 and 1941, respectively, to establish military bases at the colony. Canada expanded the Botwood and Gander airports, and built new ones at Torbay and Goose Bay, while the United States established large airfields at Stephenville and Argentia. Photographer unknown. Reproduced by the permission of Archives and Special Collections (Coll. 109 5.01.004), Queen Elizabeth II Library, Memorial University of Newfoundland, St. John’s, NL. Work did not truly get underway until the spring and summer of 1940, after Nazi Germany had defeated France and occupied much of Western Europe. Worried that North America would be next if England could not hold out, the Canadian military obtained permission from the Commission of Government - with British approval - to station air and ground forces at Gander and Botwood in June. Construction soon began at the two airports to accommodate visiting troops and aircraft. 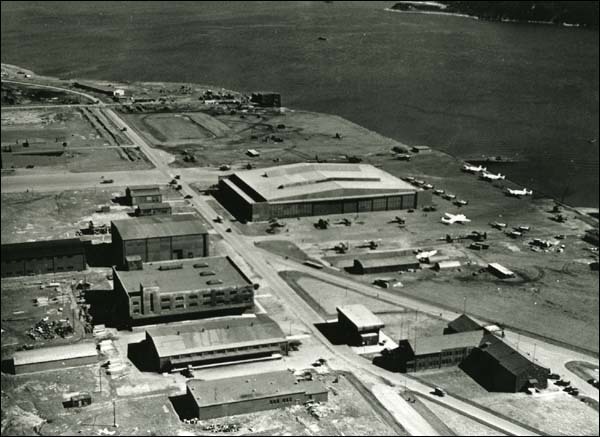 Workers at Botwood built a large concrete slipway and two seaplane hangars. Construction also started on a hospital, barracks, warehouses, repair shops, mess halls, a water supply, and various other facilities. At Gander, the Royal Canadian Air Force (RCAF) spent $1.3 million to install additional hangars, barracks, and storage spaces, and upgrade existing utilities. By 1945, the airfield consisted of four runways, more than 100 buildings - including barracks, hangars, and a hospital - and the most advanced communications system available. Canadian, American, and British troops all served there. Gander's greatest wartime contribution was to the Atlantic Ferry Operation. Soon after hostilities broke out, Britain's Royal Air Force (RAF) engaged American factories to build additional planes. Instead of dismantling the aircraft and shipping them by sea, the RAF decided to fly them across the Atlantic, using airfields in Gander and Goose Bay as stopovers. By the end of the war, Gander and Goose Bay had helped deliver approximately 10,000 aircraft. Goose Bay was an unpopulated wilderness when construction began in September 1941. Two years later, it had become the largest airfield in the Western Hemisphere. Canadian, American, and British troops served there, although the base remained under RCAF command. Goose Bay played a major role in the ferrying of combat planes to and from Europe. It also contributed to North America's overall defence and was vital in the transporting of men, freight, and classified cargo to Britain. The RCAF also built an airport at Torbay. Work got underway in the spring of 1941 and progressed rapidly. More than 400 labourers worked long shifts to drain swamps, blast rocks, and move earth. By the end of that year, two of the four runways had been completed, alongside a taxi-strip, hangars, a water supply, and various other facilities. Although less air traffic passed through Torbay than the colony's other Allied airfields, the base played an important role in hemispheric defence. For the duration of the war, Torbay helped provide air cover for convoys, patrol the North Atlantic for U-boats, and protect St. John's and Bell Island from enemy attack. It also served as a bad weather alternative for Canadian and American military aircraft. 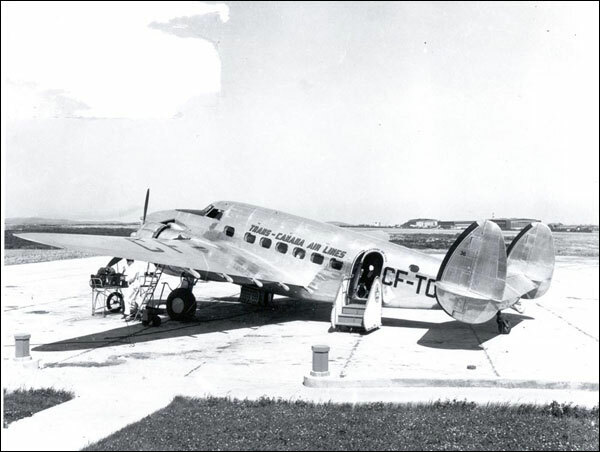 In 1942, Canada and Newfoundland agreed to provide a commercial air service out of Torbay. The first flight took off on 1 May and was operated by Trans-Canada Airlines (renamed Air Canada in 1964). On board were five passengers and a three-member crew. The airport's first terminal building, a small wooden structure, was built in 1943. Photo by Marshall Studios. Reproduced by the permission of Archives and Special Collections (Coll. 137 5.04.008), Queen Elizabeth II Library, Memorial University of Newfoundland, St. John's, NL. The establishment of an American air base at Stephenville during the Second World War transformed the largely French-speaking farming village into a booming and largely English-speaking garrison town. The site was officially named Harmon Field on 23 June 1941 in honour of Captain Ernest Emery Harmon, a pioneer in United States military aviation history who had served with the US Air Corps during the First World War. Construction of the base and its three concrete runways began in March 1941. It opened to emergency landings in 1942 and to heavy air traffic in August 1943. Stephenville's strategic location in the north Atlantic, coupled with its nearly ideal flying conditions, turned Harmon Field into a vital refueling stop for aircraft transporting personnel and supplies to and from Europe. The base also accommodated three B-17 bombers that patrolled the Atlantic for German U-boat activity between 1942 and 1944. The United States also built a large naval base and air station at Argentia during the war. Commissioned in 1941, the facility was fully operational when the United States officially joined the war in December of that year. The site consisted of three runways, each measuring 5,000 feet in length, more than 2,000 feet of wharf, a floating dry dock, hangars, storage space for 15 million gallons of gasoline and oil, and living quarters. Allied forces used Argentia for anti-submarine air patrols and task force escorts. The largest American task force in the Atlantic, made up of five carriers and more than 50 destroyers and patrol craft, was also based there. At the end of the war some of the military bases found new roles, while others closed. The American Air Force used Stephenville as a site for the air defence of North America until it closed in 1966. When the Americans left the base, its facilities were converted to civilian uses. Transport Canada assumed operation of the airport and the provincial government took over the rest of the base. As of 2012, the airport provides daily flights to St. John's, and chartered flights to Alberta and Saint Pierre et Miquelon. It also serves as a refueling stop for international flights and as the official alternate to the Gander International Airport. Argentia also remained an American naval base until the last remaining forces withdrew in 1994. The facility was handed over to the province, but was not converted into a civilian airport. It remained largely inactive until 2008, when the Canadian Forces' Air Cadet Gliding Program began using it for gliding operations. Botwood ended its commercial seaplane service in 1945, due in large part to the growing popularity of landplanes. It was later converted into a historic site. The Goose Bay airfield is the only base that has remained under military control. Today known as 5 Wing Goose Bay, its mission is to support the training and operations of Allied, NORAD and Canadian Forces. The Canadian bases at Gander and Torbay were converted into civilian airports after the war, and are today known as the Gander and St. John's International Airports, respectively. On 11 September 2001, Gander made aviation history by redirecting all westbound North Atlantic air traffic and landing 40 planes during the 9/11 tragedy. Photo by Jenny Higgins. Reproduced by permission of Jenny Higgins. ©2008. Since the war, many commercial airlines have provided regional, domestic, and international services in Newfoundland and Labrador. Trans-Canada Airlines began providing daily national and international flights to Torbay, Stephenville, and Gander in 1942, while the Smallwood government subsidized local commercial airlines after Confederation to provide services within the province. Prominent among these was Eastern Provincial Airways, which offered regular flights between Labrador and the island. Today, a variety of airlines provide regular flights from Newfoundland and Labrador, including Air Canada, Air Labrador, Provincial/Innu Mikun Airlines, Continental/ United Airlines, Porter Airlines, and WestJet. Alongside the three international airports at St. John's, Gander, and Stephenville, smaller airports, airstrips, and heliports are scattered across the province, at such places as Deer Lake, St. Anthony, Goose Bay, and Wabush.